Organization culture, internal resources and tools, industry, eco–techno environment and socio-political environment factors are combined to build a model to evaluate their impact on the effectiveness of strategic investment decisions. Empirical data collected from decisions makers in the Indian power sector was used for the study, and it was observed that all latent factors have a positive effect on the effectiveness of investment decisions at 90% confidence level. Though the internal resources and tools and socio-political environment do not have a positive impact on the effectiveness of investment decisions at 95% confidence level based on interaction effects, it may be argued that the socio-political environment strengthens a positive relationship between internal resources and tools; and the effectiveness of strategic investment decisions. There is no significant difference except for the effect of socio-political environment factors and internal resources and tools. PHULPAGAR, Santoshkumar et al. Strategic Investment Decisions: An Empirical Study of Power Sector in India. 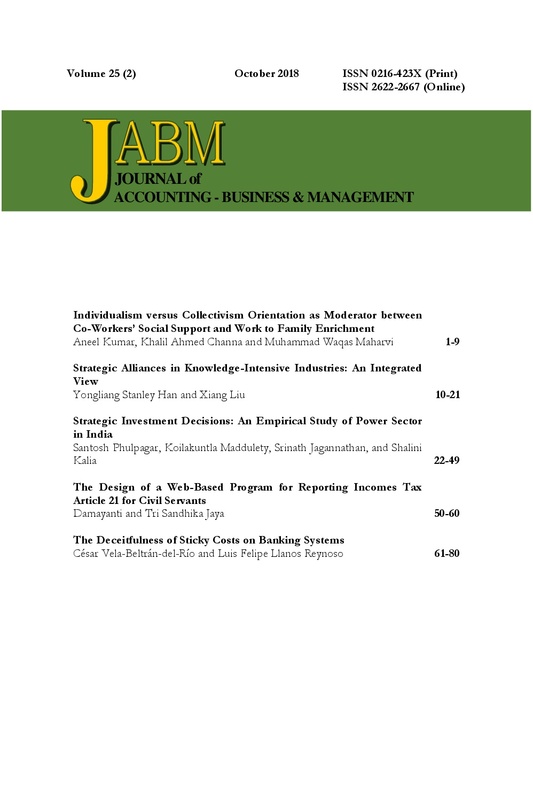 JABM JOURNAL of ACCOUNTING - BUSINESS & MANAGEMENT, [S.l. ], v. 25, n. 2, p. 22-49, dec. 2018. ISSN 2622-2167. Available at: <http://journal.stie-mce.ac.id/index.php/jabminternational/article/view/354>. Date accessed: 20 apr. 2019. doi: https://doi.org/10.31966/jabminternational.v25i2.354.